NASA's asteroid-retrieval mission, in its present form, would also help engineers test out ways of deflecting potentially harmful asteroids that could threaten Earth. 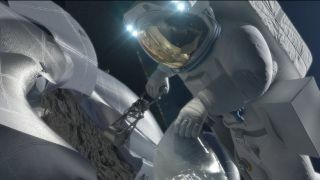 If NASA officials choose to launch a robotic mission that would pick a boulder off a larger asteroid, they could also use the robot to try to move the large asteroid into a slightly different orbit. That demonstration could aid in planetary protection, but generally, Aldrin doesn't think that should be NASA's job. "Planetary defense is not a NASA mission. It should be at the very highest level [of the] National Security Council," Aldrin said. Aldrin also thinks that humans should establish a permanent, internationally co-operative base on Mars. Aldrin believes that an insightful leader could make that particular dream happen as well. And if they prioritize a base on Mars, it could happen. "That is a legacy that will last in history for a very long time," Aldrin said. "We need to convince people of doing that, and maybe I'll retire. I kind of doubt it … There are a lot of people that think this is an 'egghead' idea, so I've got to hang around and smarten them up."